Because not many do! So your model railway will be unusual. At the same time, few 7mm modellers have the space for a large indoor layout. The solution is usually to model a small 1930s or 50s branch line with rail-cars or auto trains. All too often, the compromise is obvious, and a locomotive with one or two bogie carriages rarely looks the part. On the other hand, in the 19th Century, passenger and goods traffic was much less, and photographs of the period often show short trains of four or five four-wheelers. The train above actually ran, and there’s a photo to prove it. Probably because of the way our eyes interpret these things, a short train of four-wheelers looks more realistic than the equivalent train of modern bogie carriages. At the same time, platforms and sidings were much shorter. These two station layouts are reproduced from a scale CAD drawing showing a Stirling Q tank loco with vehicles from the SER-Kits range. The points and curves are 1200mm (4ft) radius. 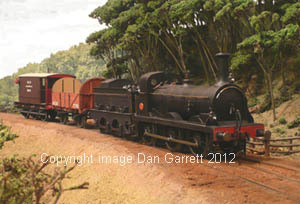 In the top layout, there can be added interest with a carriage and cattle dock coming off the run round. 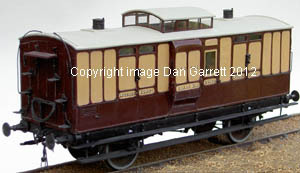 Private carriages for the gentry (represented by the landau kit) were often loaded onto carriage trucks and attached to trains while their owners travelled in a private saloon carriage. 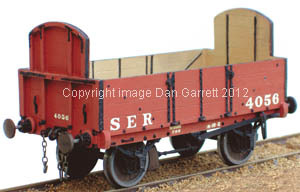 The bottom layout shows how quite a long siding can be fitted in. Three way points were common in the 19th Century (before slips came into use) and would be useful for adding a second siding. Of course, all the above could apply to any 19th Century railway. However three points are in favour of the SER: firstly it has quirky and fairly unusual vehicles such as the passenger brake van and brake 2nd with their ‘birdcage’ observatories; goods vans and brake vans were outside framed. Secondly, there’s a huge range of drawings and photographs available, painstakingly gathered by enthusiastic members of the HMRS and SECSoc to assist the scratch builder. Finally, there are few, if any, 19th Century railways other than the SER for which there is a dedicated kit and parts supplier. If you look through the catalogue, you will see that there are passenger and goods locomotives as well as a wide range of goods and passenger vehicles. Provided I remain in good health, I expect to continue to increase the range of wagons, passenger vehicles and especially locomotives. Watch this website!